Des has written in pencil ‘lack of tools and initiative of Japs’. 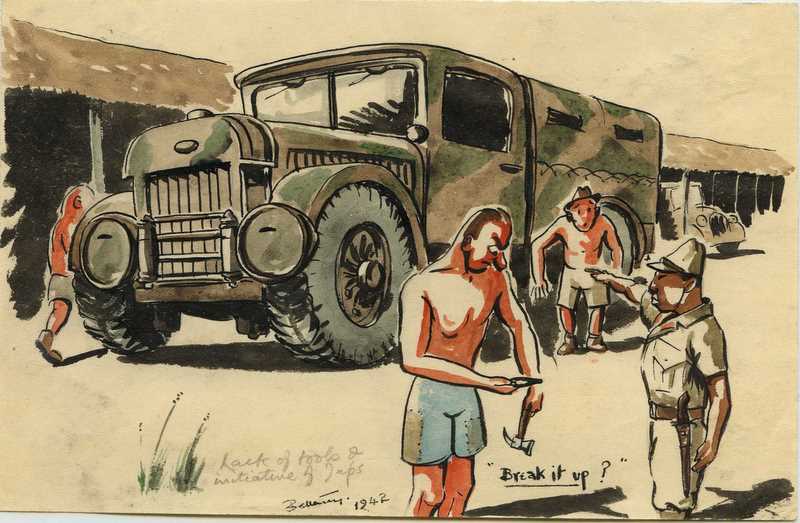 POWs were expected to dismantle large and complex pieces of equipment such as this truck with totally inappropriate tools, in this case a small hammer and a pair of pliers! Des saw how ridiculous this was and satirized it in this cartoon. Due to Japan’s shortage of steel, a lot of this ‘scrap metal’ was shipped back to Japan to melt down to build more ammunition, artillery and generally to build new ‘war machinery’.